These are the games you can play with Cozmo. You will find the standard Anki games here as well as fun custom Cozmo games programmed by Kinvert. In Keep Away you slide Cozmo’s cube closer and closer. Your goal is for Cozmo to miss when he pounces to hit the cube. He will try to trick you sometimes, and act like he is about to pounce. When you see a real pounce, you have to pull the cube away quickly for Cozmo to miss. Quick Tap is a color matching game. When the cubes match (but NOT when they’re red) you want to hit the cubes before Cozmo. This is a pretty fun game. It doesn’t get old as quick as Keep Away does as the challenge level can improve as the child gets better at the game. Another cool feature is there can be multiple colors on each cube. This is a fun game. Hundreds of our students love it and so do we. Memory Match is essentially the Simon game. We love this game as it helps kids challenge their memory. Cozmo will show a certain pattern of colors, and the player then taps the cubes in the right color order. Each round, the pattern gets longer. This is another student favorite. We have hundreds of students and I have’t seen a single student yet that doesn’t like this game. Kinvert has made several games for Cozmo. This game is somewhat similar to Asteroid. It’s not meant to be exactly the same, and is still in development. This game is similar to the Pong game. You can tilt Cozmo up and down to control your paddle. You’re the player on the left. Anki’s description – Show Cozmo that you can solve his riddles in this mysterious puzzler. 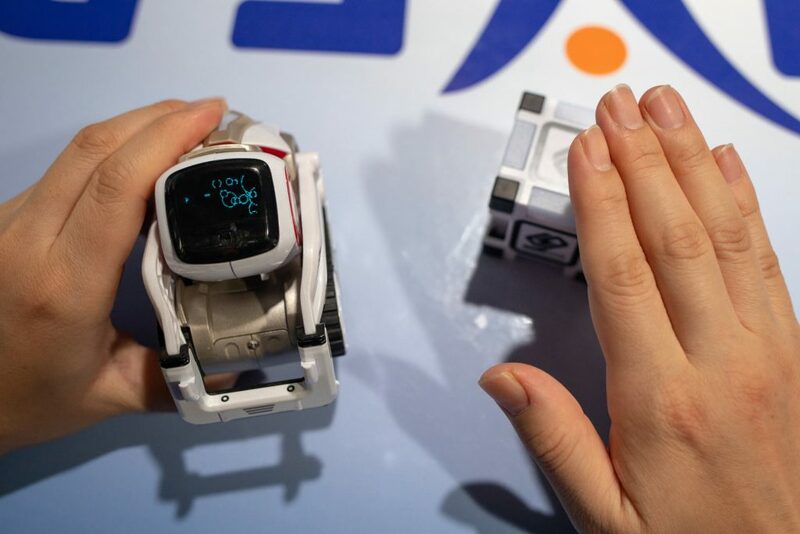 In this game Cozmo will show you on his face how he wants you to orient the cubes. The game can take a fairly long time to complete. It is a good demonstration of how much information Cozmo can get from his cubes. Anki’s Description – Make a clock with Cozmo and his Cubes! This game is basically showing how to tell time. You put one Cube at the hours position, and another at the minutes position. So for example if Cozmo asks for 12:30, one cube is in front of him while the other is behind. If Cozmo asks for 6:30, both cubes will be stacked at the 6 o’clock position. Anki’s Description – Dodge canyon walls in this fast paced game played on Cozmo’s face. This game is essentially Flappy Bird. At first I thought this game was going to be a bit hit with my students. However they thought the game was a bit slow paced, and the game mechanics were completely different from what they expected. They thought tapping would flap up, and gravity would pull down. Instead you’re just tapping one Cube to go up, and tapping the other to go down. Overall this is still one of their favorite featured projects. Anki’s Description – You’ll have to use your head in this classic action game! Again this is based on another classic game. Our students were excited for this one as well at first. In the end the thing that seemed to turn most students away was the paddle control. The input wasn’t easy, seemed jerky, and students didn’t think the paddle was going where they wanted. Anki’s Description – Do your best monster impressions and try to scare Cozmo! It was funny to see the kids faces when they played this. Anki’s Description – Take a hike with Cozmo, and try not to get him lost! Often times we’ve noticed that younger kids want games with more clear goals and game mechanics etc. Anki’s Description – Can you pop the locks on Cozmo’s secret vault, and get the goods inside? They didn’t really like this one. You just twist the cubes. Anki’s Description – Watch for flying Cubes in this colorful game of memory. This one was fairly interesting actually. Just make sure your kids don’t do this near the edge of the table or the cubes can fall to the floor. Anki’s Description – Can you guess Cozmo’s secret Cube code combo? This game is a great concept. We’re going to look at making another version with a faster pace. Your goal is to get the cubes to be the right order and color. Anki’s Description – Face off against Cozmo in a quick-draw contest and see who’s the faster blaster! This was a fun ‘Wild West’ sort of game. Students enjoyed it. Anki’s Description – SUBMITTED BY BEACOZ38 – Compete with Cozmo in this summer-themed game of Rock, Paper, Scissors. This was basically Rock, Paper, Scissors. Often times when students want to figure out who gets a first turn with something, we use this to decide who gets the first turn. It’s a fun game and the kids like it. Thanks Beacoz38! Anki’s Description – SUBMITTED BY COZMORE – Play a game of tennis on Cozmo’s Cubes, while he acts as referee! This was a great idea. Thanks Cozmore for such a great contribution! Anki’s Description – SUBMITTED BY BEARAIR – See if you can stump Cozmo by shuffling his Cubes. Thanks for making such a cool game BearAir! Anki’s Description – Twist Cozmo’s Cubes to collect the treasures marked on the map on his face! This time to move around the screen we twist one cube for up and down, and the other cube for right and left. This is another game that uses Cozmo’s face screen. Anki’s Description – Go head-to-head against a friend in this fast-paced game of Cube dexterity. Anki’s Description – SUBMITTED BY FARDENCO – The tide is high but Cozmo’s holdin’ on. Tap Cubes in order to save him! Anki’s Description – Even robots need to blink. Take on Cozmo in a staring contest! Some students enjoyed this game. It’s a staring contest with Cozmo. Anki’s Description – SUBMITTED BY COZMORE – Take aim and control Cozmo to blast his Cubes! Thanks for all these fun games you made Cozmore. Anki’s Description – SUBMITTED BY COZMORE – Try your luck at Cozmo’s sensational slot machine! Cozmore is on a roll with all these games. Anki’s Description – SUBMITTED BY COZMORE – Test your memory with Cozmo’s tricky color shuffling game! Thanks Cozmore for yet another awesome game! Anki’s Description – Celebrate Earth Day by growing a garden with Cozmo! Many just moved on quickly after their first attempt. Anki’s Description – SUBMITTED BY JDFIGHT – The mystical all-knowing Cozmo will guess your number! Students loved this game. It was fun to watch some of them figure out how Cozmo did it. Anki’s Description – Who dares to disturb Cozmo at naptime? Tap the cubes that are spinning blue. Anki’s Description – Challenge Cozmo to a match. Be sure to use your head! Similar with the Rebounce game, students were frustrated with the controls. Our students strongly prefer our version where we are using Cozmo’s pitch angle instead of using their face position. Anki’s Description – Circle up for Pi Day! This was another game without clear game mechanics and most of our students moved on quickly. Anki’s Description – The ultimate St. Paddy’s treasure hunt! This is one of the more fun games. Make sure you do it on a large flat area, such as a wood floor. Students liked this one. Anki’s Description – Cozmo’s got something nice to say! Anki’s Description – Vroom, vroom! Drive Cozmo at top speed. Sort of like Explorer Mode. Anki’s Description – Shake things up with this new game. Shake the colored cube Cozmo asks for. One cool thing is mixing colors. If Cozmo asks for Orange, you need to shake Red and Yellow. Anki’s Description – Can you get a hole-in-one? This game has two circles. You tilt Cozmo to make one circle overlap the other. Anki’s Description – Give a Valentine to a friend, Cozmo-style. Cozmo draws an envelope with a heart on it, then says a lovely poem. Anki’s Description – Turn that frown upside down! In this game you move your head side to side. When you see the triangle under the frowning face, you smile. Anki’s Description – Tick, tock! Timers are more fun when they’re a Cozmo. This isn’t really a game. However students love the fire truck animation. Anything with that fire truck animation is a big hit. Anki’s Description – Shake Cozmo and have your fortune told. This was basically a magic 8 ball. Anki’s Description – Turn off the lights and groove to the music. Students absolutely loved this one haha. You should hear a classroom full of kids playing music with Cozmo. One of our top picks here. The kids love to dance with Cozmo. Anki’s Description – What that Cube! What’s your high score? Another fun game. This one was popular and well liked. Anki’s Description – It’s your own tiny orchestra, and Cubes are your instrument! This one seemed a little confusing. Also in the current software version the sounds don’t seem to play. Anki’s Description – When the music stops, don’t get stuck with the hot potato! This was another fun game the students enjoyed. We also have an article on Games to Play With Vector. If you’re interested in games for Cozmo some other things to take a look at include the Anki Cozmo SDK, Cozmo Vs Vector, and the Anki Vector SDK. We also have many Cozmo Examples and Vector Examples written in Python using the SDKs. If you’re interested in getting started in learning robotics, we have articles on What is Robotics, Block Coding, and Age to Teach Kids Python.